Canada Post is one of the world’s biggest national mail carriers. If you are shipping in and out of Canada, needless to say, you will want to work with Canada Post. Canada Post Integration with your e-commerce store can be done with the help of StorePep and you can effortlessly display real time shipping rates at checkout, generate and print shipping labels and manifests, request pickups, track orders, and manage returns. A true one stop shipping solution for your e-commerce needs. Before you can integrate StorePep.com with Canada Post, you must first ensure that your StorePep account is up and running. Our related articles will help you connect your StorePep account to your Shopify, WooCommerce, and Magento stores with ease. Once this is taken care of, we can start integrating Canada Post carrier shipping on your StorePep account. NOTE: This process requires you to have a Canada Post account. You will be asked to Sign In during the course of the integration. If you do not have an account, you will have to Sign Up for a Business account in order to continue. Now head over to your StorePep account and from the StorePep dashboard, navigate to the ‘Settings’ section. Go to ‘Carriers’ and click on the ‘+’ sign next to it. You will get an option to add your ‘Canada Post’ account to StorePep. Clicking on ‘Canada Post’ will take you to the following page. Click on ‘Connect and Get Credentials’. You will be redirected to the Canada Post official website where you will be prompted to enter your credentials. Simply Sign In to initiate the integration process. Complete your verification process with Canada Post by providing your personal details. You will then be redirected to your StorePep account. Enter the credentials you have obtained in their respective fields and click on ‘Connect’. With this, the Canada Post integration with your StorePep account is done. You will immediately start receiving real-time Canada Post shipping rates in your checkout pages. 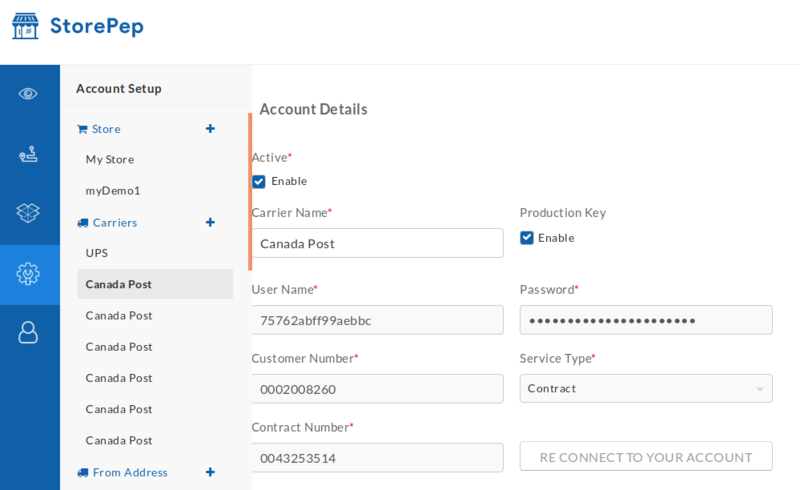 You can now manage all your Canada Post shipments from the unified StorePep dashboard.